While the population of seniors grows considerably, the number that can't meet basic increases in living expenses. Between 2010 and 2018, the group grew in poverty by 56,000 people and the number that resorts to informal employment grew by 44,000. 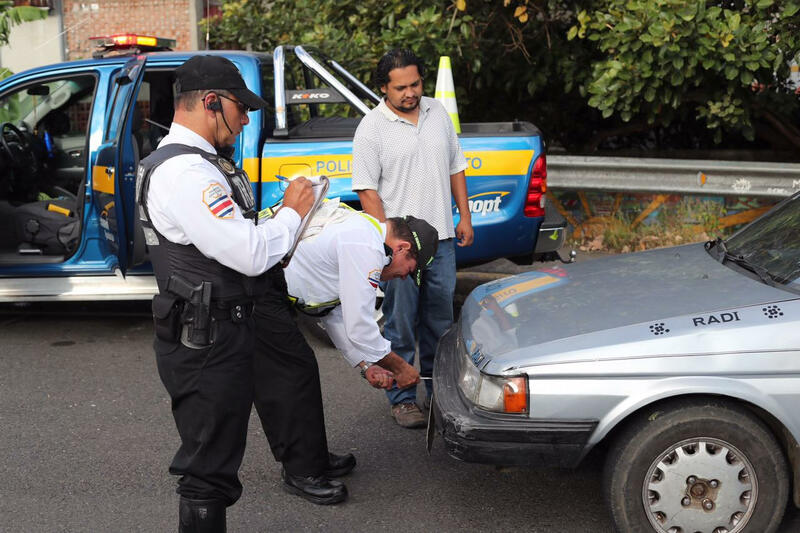 Every year, poverty in Costa Rica reaches more seniors (adultos mayores), a situation that, paradoxically, condemns thousands to have a worse quality of life in what should be the stage of development of greater fullness of people: old age. 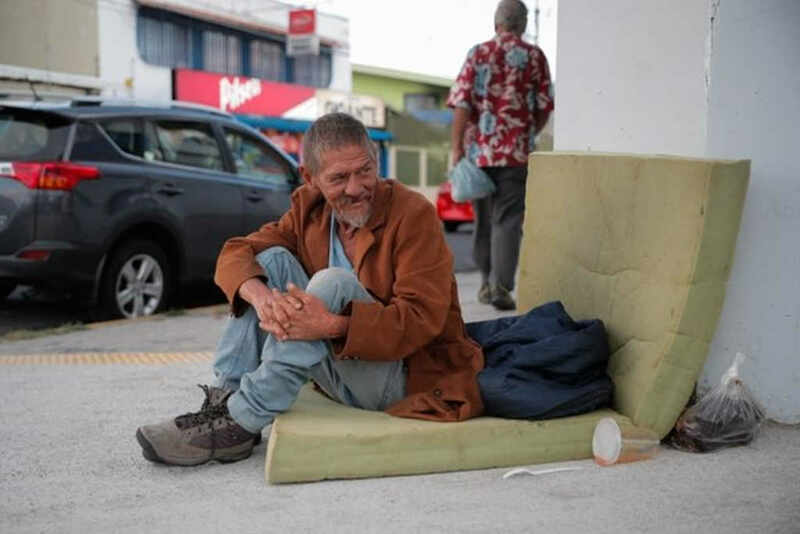 Between 2010 and 2018, the percentage of poor people in that population segment went from 21% to 24%, according to the Encuesta Nacional de Hogares (Enaho) del Instituto Nacional de Estadística y Censos (INEC) – National Household Survey of the National Institute of Statistics and Census. 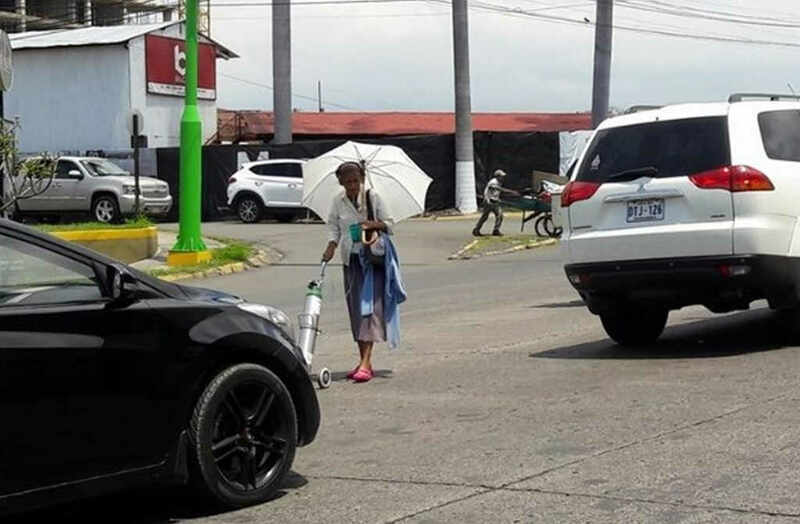 This unidentified senior wanders, with her oxygen tank, through Escazú, asking people for money. Image published on Facebook by Noticias Puriscal. Most seniors are now in non-extreme poverty, where they lack sufficient income to cover their basic needs. In that time frame, the percentage went up from 16.2% to 19.2%, that is, from 58,000 to 105,000 individuals. In the case of extreme poverty, where their income does not even cover for basic food, the percentage remained practically the same, at 4.8%, although in numbers it went from 17,000 to 26,600 people. At the same time, the number of seniors with an informal job increased considerably. Among those over 65 who work, the percentage with informal employment rose from 66% to 88% from 2010 to 2018. That is, today, almost nine out of 10 senior citizens do so in the informal sector. Róger Vega, 68, sells cloths at the Guadeloupe traffic lights junction. He is one of the 80,000 older adults who find in informal employment a way to cope with poverty. Photo: Rafael Pacheco. In a report by La Nacion, Róger Vega Molina, is a 68-year-old street vendor, resident of San Miguel de Desamparados. 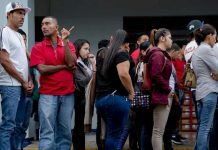 He receives a pension from the non-contributory scheme of the Costa Rican Social Security Fund (CCSS), of ¢78,000 colones per month, but that is not enough to even cover the ¢90.000 monthly cost of a room in rents in La Capri. 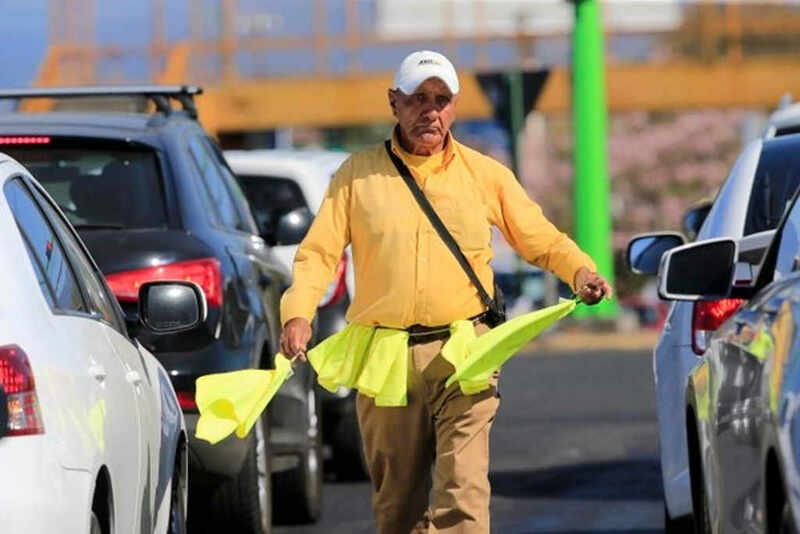 To make ends meet, he works daily selling hand towels at the intersection of Guadalupe, from 6:00 am to noon, earning about ¢4,000 colones daily, money that, in addition to providing a roof over his head allows him eat. “With that I got home, sunnied and tired. There, at the Bourbon market, I pay ¢1,500 for a ‘casado’. In the afternoon I have a coffee. Since I’m prediabetic, I cannot eat rice or anything like that,” he told La Nacion. According to the data from the Household Survey of 2018, the older the population, the higher the poverty level among the older adult population. According to the data from the 2018 Household Survey, for example, among those aged 65 to 74, 21.8% lack sufficient income for their basic needs, but the percentage grows to 28.4% among those who are over 85 years old. Why are so many people over 65 years of age impoverished? According to Gilbert Brenes, director of the Centro Centroamericano de Población de la Universidad de Costa Rica (CCP-UCR) – Central American Population Center of the University of Costa Rica – generations of seniors today had fewer opportunities to access education, which reduced their chances of achieving well-paid jobs. “The seniors today belong to a society in which investment in education was not so broad, so the number of years of education that the majority concluded is relatively small. “It has to do a lot with the educational level and with the productive change that occurred in Costa Rica during the last part of the 20th century and the beginning of the 21st,” he said. In the past, agriculture was the basis of production in the country, but the scheme changed to a service economy that required qualified labor and, consequently, better paid. “That population that today is old and with limited economic possibilities were left behind,” explained Brenes. Also, thousands cannot access a regular pension. 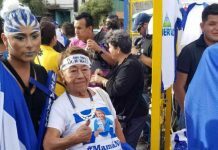 According to the Nacional de la Persona Adulta Mayor (Conapam) – National Council of the Elderly, the main economic bastion of the elderly population in the country are the non-contributory pensions of the Caja. The Conapam ensures that this represents the only income for 41% of the elderly. Currently, 119,477 seniors benefit from a subsidy of this type, and there are 22,440 people waiting for one of these pensions, according to data from the Caja. Meanwhile, the pension scheme of Disability, Old Age and Death (IVM), the largest in the country, has 274,000 pensioners. Thousands of seniors were unable to access one of these because they worked informally, without contributing. Many women were assigned domestic chores, which prevented them from contributing, according to Conapam. Between 2010 and 2018, the number of people over 65 grew significantly, going from 357,000 people to 546,000. In fact, it was the age group that increased the most among the entire population, as it increased by 50%, while people under 20 decreased by more than 4%. Not in vain, the group of seniors went from representing 8% to 11% of the total population in just eight years. The projection of the INEC and the CCP is that, in three decades, this age group will triple. There would be 1.3 million seniors in 2050.